Retard® will inhibit growth of various Ivy, Shrubs, Trees and Turf. Will Retard® eliminate the need to mow? Retard® will not eliminate the need for mowing, however, if applied according to the directions, it will significantly decrease the growth helping to decrease the number of times mowing is required. How long before a rain should Retard® be applied without having to reapply? Retard® needs twelve hours to be totally absorbed by the plant. 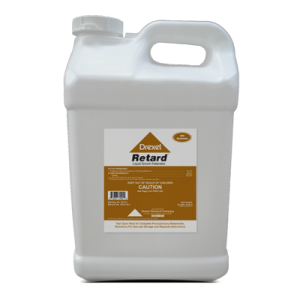 Is Retard® safe for pastures? Retard® can be applied to pasture land, but do not pasture livestock or cut hay from the treated area.